We're getting into a groove with homeschooling. The change in curriculum threw us all for a loop, but we're settling in and finding our way. Nate is doing extremely well with the online portion -- in no small part because 98% of it is read aloud to him. The writing portion is more of a struggle. Colin is working hard, but there are many multiple choice tests and he's not a very good test taker apparently. I'm not really surprised, as I've always taught to knowledge in the past -- and not to a test format -- so it's new territory for him. We've talked about test taking strategies and he's improving. He's retaining the knowledge, he just struggled with the multiple choice format. Last week, we took a day off and spent it at a local resort. They have multiple pools and a waterslide and were offering day rates. We had the pools pretty much to ourselves, since it was a Thursday during the school year and the weather couldn't have been nicer. The special included a suite and a private poolside cabana, so it was no problem getting Lydia her afternoon nap. It was nice to spend the day, but then come home and sleep in our own beds. I can't believe we only have 2 weeks left of baseball! The season went by quickly (as it always does) and I am still impressed at the level of play both boys displayed this year. Part of it is age, part of it is experience, and a big chunk of gratitude goes to the coaches this year for helping them improve dramatically. This is the first year Colin has enjoyed it in the last few years -- and he is really excited about playing. I never thought I'd sign him up for Little League, but it looks like spring ball is in our future. 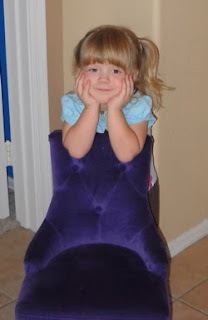 Lydia recently convinced her aunt to buy her the chair pictured above. She saw it at Ross and declared it her "perfect, purple chair that is in my house." And, so, now it is in our house. Religious education classes started yesterday. Nate will make his First Communion in the spring, and I'm not exactly sure what Colin is learning this year in class. We always supplement at home with lessons, so I look at it more as a community-building activity and social outlet. Bo went away last weekend to help a friend install air conditioning. He took the boys with him, and I confess that Lydia and I had a lovely weekend on our own. Bo is going away again this weekend, but between baseball and religious ed, the boys will have to stay home this time. I really enjoyed the quiet of just the two of us and will encourage more weekends away in the future. I love the chair! Purple is a great color. I just love that chair. And I love that you and Lydia got a "girl day"! Sounds like things are going well and that Lydia has Aunt Bunny wrapped around her little finger. Just got back from my WI River camping adventure. Too tired to blog, but figured I would catch up on reading a couple of friends' blogs.